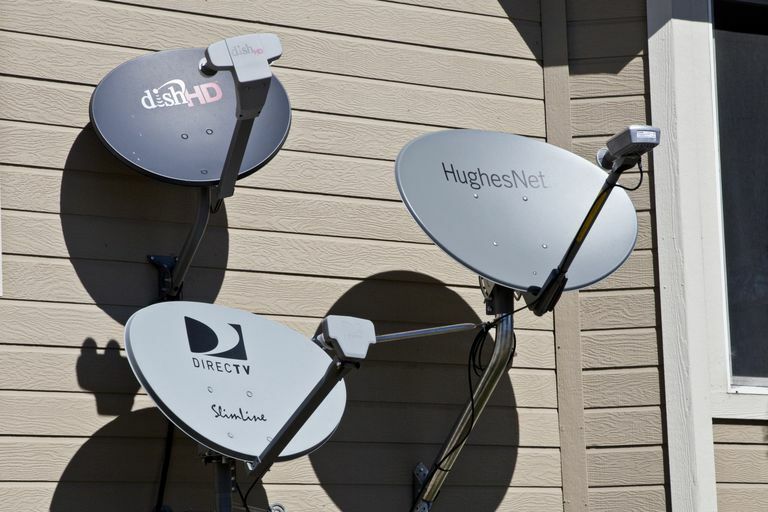 DirecTV and DISH Network have battled for satellite supremacy for many years. Comparing DirecTV and DISH Network should help you make a sound decision regarding your satellite provider or compare against local nonsatellite providers. You can receive programming from both satellite companies as long as you have a clear view of the southern sky. Both companies state this requirement in their advertising literature, so it's something you should consider before committing to this type of service. If you live in a downtown area with many large structures blocking your view of the sky, satellite TV is probably not the technology you should go for. When in doubt, ask the provider to test your location prior to signing up. Service contract locks in price. Contracts difficult with income changes. Must read the fine print. To get the best offers on DISH Network, you must commit to a service contract, likely for 18 months, but you can do a month-to-month service agreement if you like. The month-to-month downside is financial; you won’t be able to take advantage of certain special offers. Also, you’ll likely have to pay for installation. DirecTV typically requires subscribers to agree to a service contract that lasts anywhere from 12 to 24 months. If you cancel your contract with either company before it expires, you might be subject to penalties and cancellation fees. Read the fine print before giving credit card information or signing the contract. Save money with fewer options. Beware extra fees for premium channels. Not all channels are HD. ﻿Both providers offer similar packages, from basic family programming to all-inclusive packages that include premium movie-channel subscriptions. On average, DISH Network's daily prices are lower per month than DirecTV’s package of the same type. The reason DISH Network has lower prices is that it generally offers fewer channels or services on average compared to DirecTV — for example, 100 channels compared to 200, or a lack of HD or DVR service. DirecTV typically offers several months of free programming to new customers and builds in HD service and expanded channel lineups within basic programming packages. The cost of the basic package will shoot up to the regular monthly price when the special-offer period expires. Both carriers assess a standard monthly charge for every HD and non-HD receiver beyond the primary receiver on the bill. Remember, the first receiver is built into the package cost. The key difference between DirecTV and DISH Network is that a four-room system for DirecTV will likely use four single-tuner receivers (you will be charged for three) while a four-room system on DISH Network will likely use two dual-tuner receivers (you will be charged for one). Better for multiple TV households. Not all TVs can handle HD. May require extra hardware and fees. DirecTV usually beats DISH Network on price for HD offerings and the overall HD-channel lineup. Both providers often offer deals — for example, free HD for up to six months. DISH Network usually offers the best monetary value with these specials. Rebates can greatly reduce price. HD carries many hidden fees. ﻿New DirecTV subscribers must pay a leasing or upgrade receiver fee upon signing up for service. You won't buy your receiver; you'll lease it and return it to DirecTV after you're finished with the service. DISH Network is known for its leasing of equipment, but now the company also sells receivers, although they tend to be expensive. You won’t have to pay the monthly leasing fee for every receiver you own, however. Digital video recorders (DVR receivers): DirecTV has an upgrade fee but usually offers an instant rebate that covers the cost of the receiver, making it free. DISH Network doesn’t charge an upgrade fee but assesses a monthly leasing fee if you don't opt to buy. HD receivers: DirecTV has the same deal as the DVR, in which new subscribers can upgrade for a fee that's rebated, making the HD receiver free. DISH Network does the same for its HD receiver as its DVR. You pay a monthly leasing fee or you can buy it. HD-DVR combo receivers: DirecTV has an upgrade fee, but they sometimes offer a rebate, which brings the price down considerably. DISH Network has the same deal as its DVR and HD receiver. You can lease the receiver for a small monthly charge or buy it outright. Premium channels usually available with fee. Many channels are low quality. Movie channels aren't always included. Sports channels aren't always included. Minus a few provider-specific channels, the channel lineups for these two providers are about equal. This is a business question. If one provider has a certain channel, then the other will offer it, too, to compete on level ground. So, the key difference is the level of the package you need to subscribe to so that you can view your favorite channels. DirecTV gives you the full 200 channels on its third-lowest-cost package. DISH Network requires you to move up to the fourth-lowest-cost package to get 200 channels. When you get down to it, DISH Network has more options with respect to channel lineups. If you don’t want the full 200 channels, a 100-channel package is available. On the high end, DISH Network has a few more channels than DirecTV, but you get the same movie channels — so it's pretty much a wash.
DirecTV seems to force subscribers to buy into its 200-channel packages instead of offering a basic package with 100 channels. DirecTV's model is good for add-ons, like HD and DVR service, but not everybody wants the added expense needed to get the 200 channels. Local channels offer news and weather. Offers a more personal experience. Local news and weather available online. Extra fees may not be worth it. Usually local channel options are limited. DirecTV offers about 70 nationwide HD channels, and DISH Network, about 38. Both say more are on their way. Both companies struggle to provide local HD channels without an over-the-air (OTA) antenna, but things are getting better. They have many markets available, and you can use a tool on their respective websites to see if local channels in your area are available in HD. If not, you can still use an antenna that attaches to the satellite dish to receive your local programming in HD. Enables multiple devices for TV watching. DirecTV and DISH Network both offer portable satellite systems. DirecTV’s model contains a 17-inch LCD monitor, antenna, and satellite receiver. It also has component and composite audiovisual inputs in case you want to connect a game console or DVD player, as well as a composite A/V output, phone jack, and USB connection. You can use AC or DC power or the unit’s rechargeable one-hour battery. DISH Network has a product called PocketDISH that is very similar to a video iPod. Users can apparently play prerecorded programs on a portable console. You would need to download these programs into the PocketDISH. DirecTV offers DirecTV Now, an app that allows you to stream your complete package, through the internet, to your mobile device. Does Seeing Duplicate Channels on Your Program Guide Drive You Nuts?